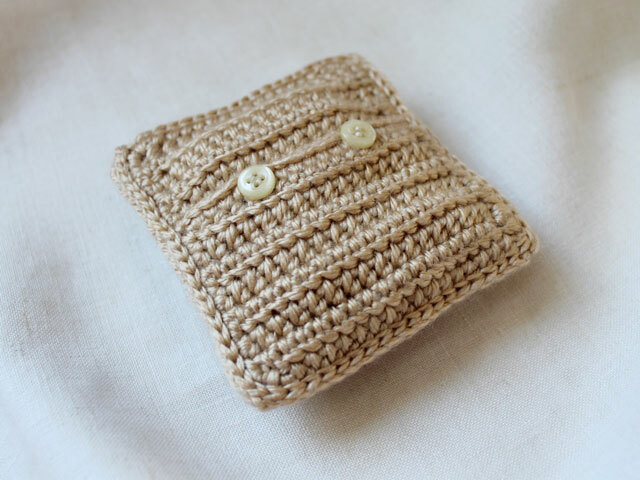 While this might look like a post about crocheting, it's really more about how you can make an aromatic sachet, that is scented with your favourite essential oils or perfume, and that can be refreshed whenever needed. 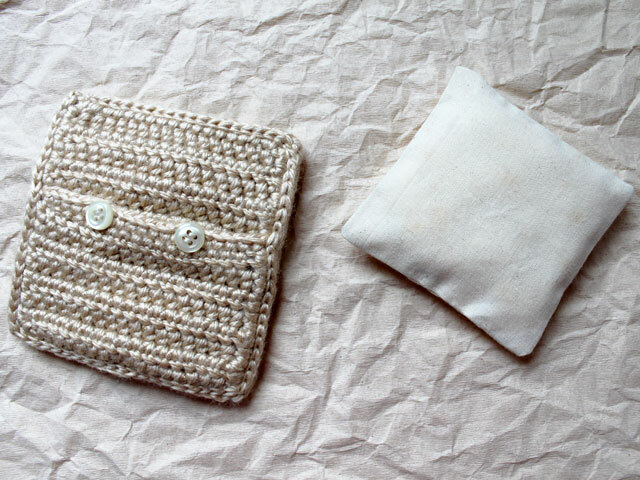 The idea is to make a little cotton pillow, that tucks inside a pretty cover. 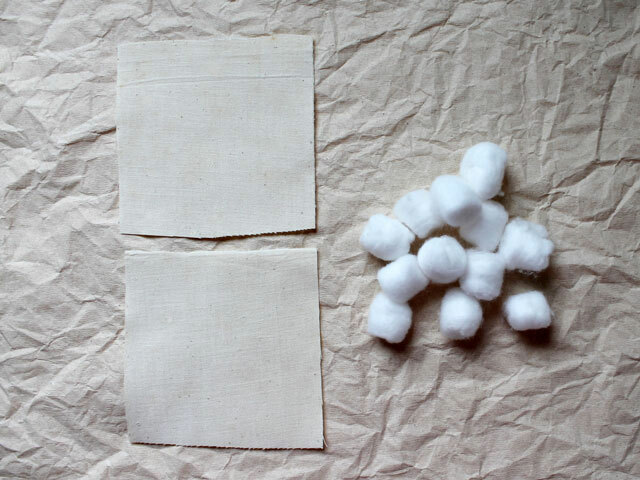 Then you can add your own scent to the pillow, where it is absorbed within the cotton cover and stuffing. Adding oil or perfume will inevitably stain the pillow, but you'll have a nice looking cover to go over it, that hides any discolouration. 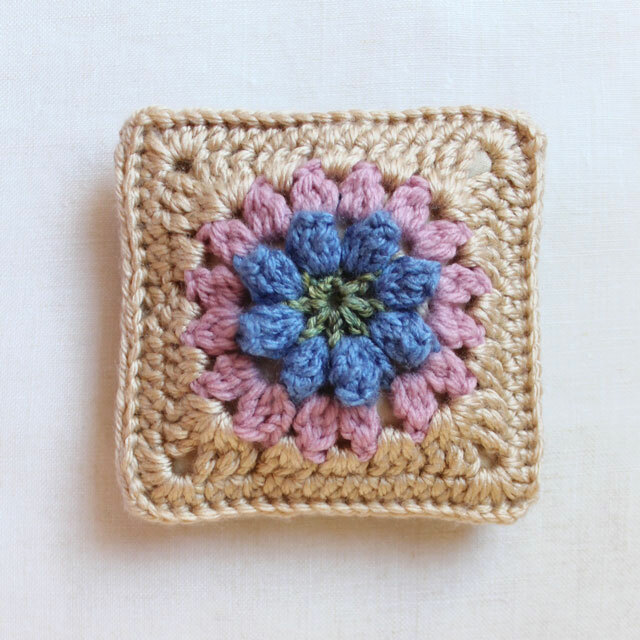 I crocheted a cover for mine, using this lovely pattern called 'Primavera Flower Granny Square' that I found over at Dada's Place Blog. 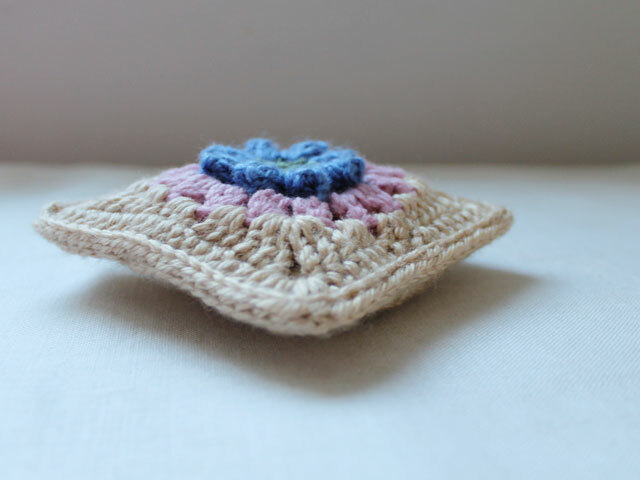 As soon as I saw this cute 'puffed up' flower pattern I knew I had to try making one. 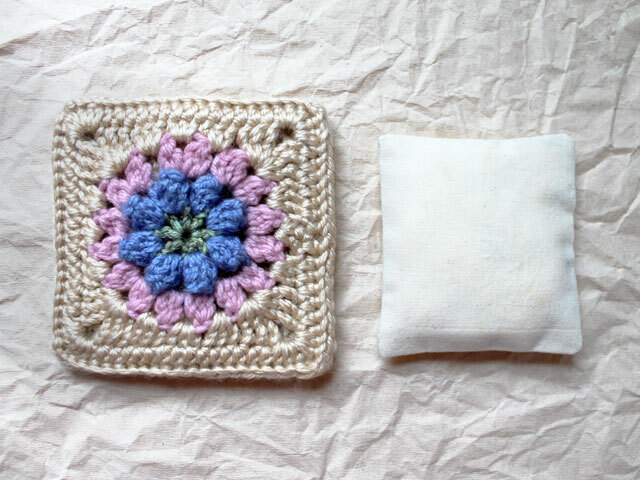 But if you're not a crocheter you can make a cover for your sachet out of fabric or felt, plain or quilted. Or if you knit, you can knit one. I added some buttons to the back of mine, however if you make your back pieces big enough to give a good overlap, you can just rely on the overlap to contain your pillow. 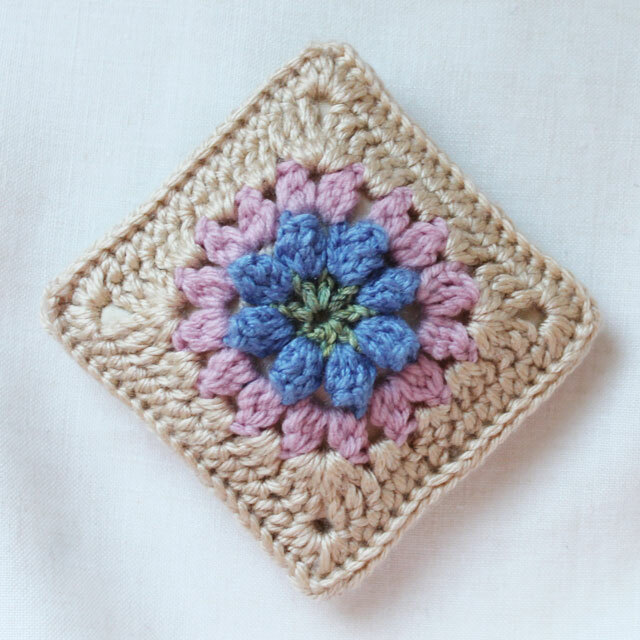 Make a granny square of your choice, that ends up being about 4 inches across. I added an extra row of stitches around the 'Primavera Flower' pattern to make it a bit bigger. Then make the two back pieces by crocheting rows of half-double stitches. 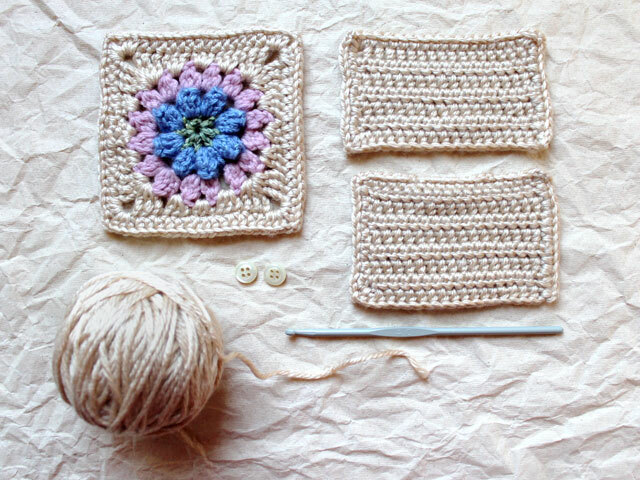 Make them long enough so that when attached to the granny-square front piece, they overlap by one row. Add a border of single stitches around each, so they end up looking like what is pictured below. To make the button holes I chained 2 and skipped 2 stitches while doing the border. The pieces are attached together with a crocheted running stitch, going through both layers (and all three layers for the bits that overlap), all the way around. Lastly, just sew on your buttons. For the pillow part, it's important that it be made from 100% cotton - both the cover and filling. That's so the essential oil or perfume you put on it absorbs right into it. 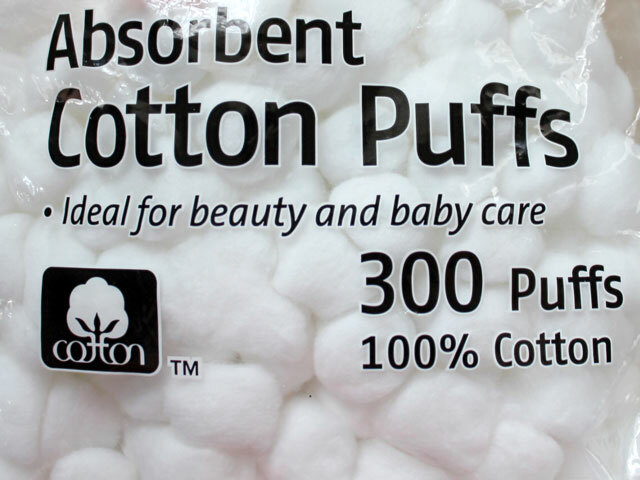 Note that not all cotton balls are pure cotton, so make sure you look for some that are. Alternatively, you could fill it with small pieces of an old cotton garment like a t-shirt. I scented mine with 10 drops of essential oil. 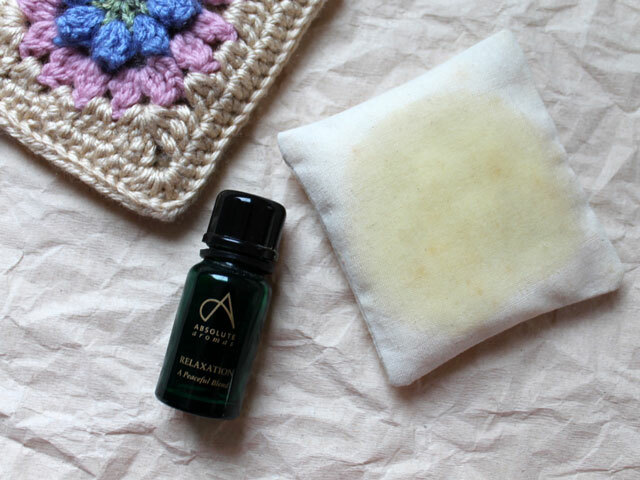 The aromatic oil has a slight yellow colour that stained the cotton pillow, but you can't tell it's stained once the cover is on. The scent will last for quite a while, but when it dissipates, I'll just take the pillow out of the cover and add more, letting the oil or perfume dry before inserting it back into the cover. I'll be putting mine inside my suitcase, to add a lovely fragrance to it while it's empty and awaiting my next trip. Then it will scent the contents I pack when I'm travelling. When I reach a destination, I'll have the sachet with me to add a nice aroma to the hotel room, closet or dresser drawer. I got the idea to do that after packing one of these bath-bags in my suitcase once. I didn't end up using it in my bath during the trip because I wanted to keep it around, for the the nice smell it was imparting to the hotel room. I hope you'll try making one for yourself or to give away as a gift, because having things around that smell good add to a feeling of happiness and well-being, right? Thanks for taking a look. Have a good weekend! 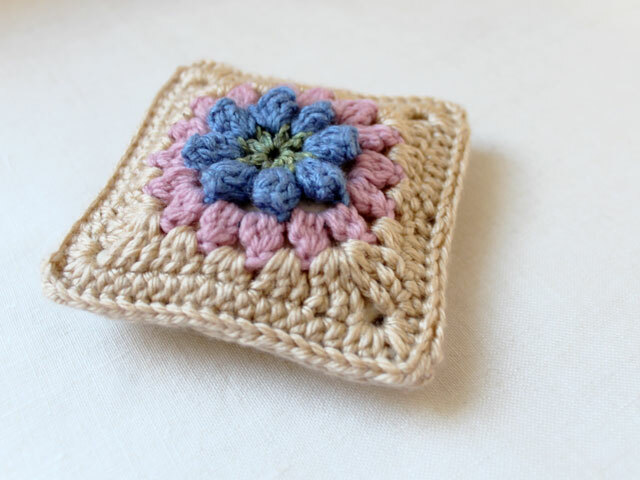 Hi Loulou,It is a beautifully made sachet, love the pattern and the colours. And, thank you for the tutorial; I noted down useful tips. ooh, that is so pretty, and what a great idea! Especially putting it in a suitcase. I need some of those for the kid’s bureau. We got it from a family that smoked indoors. Blech. Thank you Jessica. I’m glad you like it! Since the scent is captured within the pure cotton batting that’s inside the cushion and the 100% cotton cushion cover, you can use any yarn to crochet the outside cover, because the hole-y nature of crochet stitches means the scent will ‘escape’ no matter what it was made with. Mine was a stash buster, with mixed compositions and weights of yarn.